When it comes to commercial aluminium doors, there are many reliable commercial entrance doors available from all the major systems companies. The theory behind a commercial entrance door is the hollow door stile designed to accept many different types of locks, latches, panic bars, access control systems and even magnetic and swipe card locks. The top and bottom rails of a commercial door are designed to accept the many different types of concealed or face applied closers, floor springs and even an automatic swing or sliding door. Commercial doors in their original form still sell well to this day widely used in shops, hospitals, schools and offices. What guarantees are available with commercial aluminium doors? Commercial doors have few firm guarantees. Kawneer commercial doors have a lifetime guarantee. The residential home improvement market has stabilised itself on a ten-year warranty provided by the installer. For commercial doors, there is no set guarantee in place. Commercial door manufacturers and systems companies do stand by their product, but it is more common for commercial doors to ride on the back of existing guarantees. These include paint warranties, hardware guarantees and for the glass itself. Kawneer UK is the only company we know of offering a lifetime guarantee on their 190 and 350 commercial doors. This warranty has been in place for over two decades. What does this mean for the installer and the end user? The Kawneer UK Lifetime Guarantee on commercial doors. The Kawneer 190 commercial door is a heavy duty commercial door using standard size door stiles suitable for heavy use. The Kawneer 350 door provides bigger door sections and is intended for severe usage. Both Kawneer 190 and 350 commercial doors come with a Kawneer Lifetime guarantee. Kawneer calls the welded construction of their commercial door Dual Moment. Doors are four times welded as well as mechanically joined. This method is the strongest method of assembling a door joint and offers remarkable strength. The Kawneer UK 190 and 350 commercial doors have undergone laboratory testing to reinforce their superior strength, construction and design. Why provide a guarantee on a commercial shop door? One of the reasons why commercial doors do not have a set guarantee is because once installed it is unclear how they will be used. Commercial entrance doors are subjected to intensive use by scores of people on a daily basis. Kawneer commercial doors provide many years of reliable and functional operation. If we consider why a 10-year guarantee would apply to a door in a private dwelling as a comparison, there are some marked differences. Residential doors are installed in a low use domestic environment. Residential doors are used with much more care and consideration than a commercial door. Residential doors have usually been paid for by the user. A residential door is not subjected to the severity of use and is a door with far less risk attached to it than a commercial door. The life of a commercial door is different to a residential door. Kawneer commercial doors are providing reliability and security to commercial buildings, local shops, schools, airports and hospitals all over the UK. Some Kawneer entrance doors are over 30 years old and still performing faultlessly to this day. 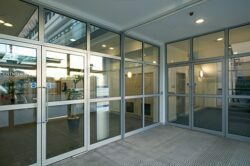 Benefits of commercial aluminium doors. A commercial door fitted to a high street shop or retail store may have several different occupiers during its lifetime. Some may undergo a complete refurbishment but for kerbside properties the shopfront, once installed remains. As shops change hands the use of the door may change as well. A commercial door to an Undertaker, for example, may not have the severity of use as a change of use to a store selling children’s clothing that will arguably have more parents with pushchairs using it. A commercial door provides a long term solution in a commercial property because it cannot be taken for granted how it will be used. A school may have children banging or kicking the doors open. During School breaks and at the end of the school day, it is not uncommon to see hundreds of children going through a door set within a short time frame. Consider doors in stadiums, concert halls and theatres. These too are venues designed to hold thousands of people and doors have to withstand such extreme levels of traffic. Finally, there are commercial doors in factory buildings where (despite advice to the contrary) staff can use trolleys, stillages and other equipment to open a door. It is for this reason that Kawneer doors are designed to offer a lifetime of reliable service with quality locks and closing devices in a heavy duty, high traffic application. The Lifetime Guarantee from Kawneer remains one of the reasons why Kawneer doors are so widely specified by architects. It is also worth knowing that Kawneer invented the shopfront and the shop door. If you would like further information on the Kawneer 190 and 350 commercial doors or the 10D thermal commercial door, please contact us.